Showing videos in a pop up light box like blogger lightbox images is really cool and it boosts video views too so I decided to share this cool stuff with you. In this post I am going to show you how to add pop up light box video player in blogger but before that I want to tell u that its a different player so can't just get embed code of your video and paste it and start showing pop up. This player works in a different way so first you need to add code of this player in your blog and after that you need to add ID of a Youtube video. Remember that it can't play other videos like Dailymotion. Only vimeo and YouTube videos can be played with this player. And to play a video you need to add its id first whether you want to play a Youtube video or Vimeo video, in both cases you need its id. So in this post I will show you how to add pop up light box YouTube or vimeo video player and how to get id of a Youtube or vimeo video. 1. Its free of cost. 2. Doesn't slowdown your blog, no render blocking scripts. 4. Can play both YouTube or Vimeo videos. 5. Stylish and responsive design. 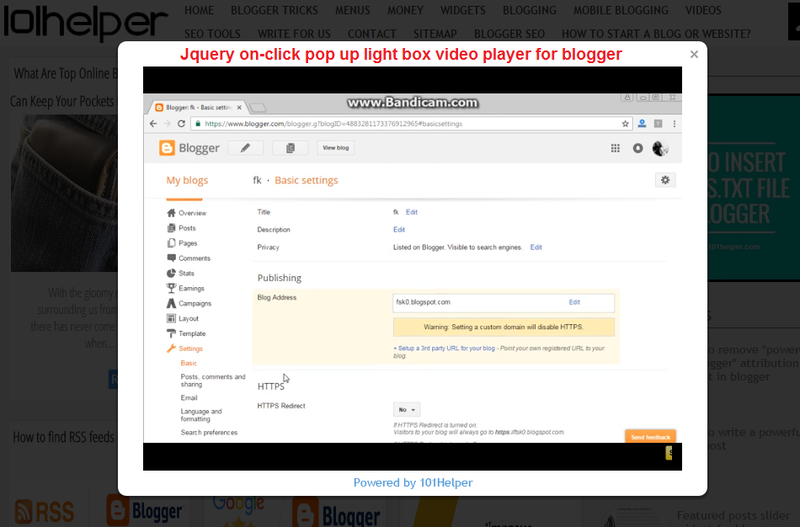 How To Add Pop Up Light Box Video Player In Blogger ? Step 2: Open Layout of your blog. Step 5: Replace "YOUR VIDEO ID" with ID of video which you want to play in pop up. How To Get ID Of A Youtube Video ? 0mFXo88pyaU is the ID of this video. How To Get ID Of A Vimeo Video ? 188471047 is ID of this video. Step 6: Save your gadget and you are done. How To Customize Video Player ? You can show your video's thumbnail which when clicked will show the pop up or you can show some text like "watch this amazing video" both of these will play role of a trigger. To add your video's thumbnail replace https://i.ytimg.com/vi/0mFXo88pyaU/hqdefault.jpg with your video's thumbnail link. Replace YOUR VIDEO ID with your video ID. I hope you loved this post, if not and you want to give any suggestion, feel free to contact us or leave a comment below. Your feedback is really valuable! Thanks for visiting 101Helper. ♡ Happy Blogging! Great post about video popup. I got one question, I'm trying to add a few more buttons/image link to a few video popup on the same page...the buttons appeared but only one video popup and the other have voices but no video images. Make sure you have put Video Id right because player will play video by its Youtube ID, It doesn't care how many buttons you add it will play videos by ID.